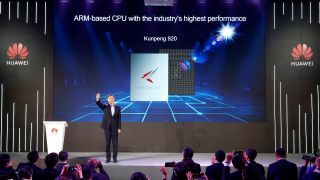 Today at CES 2019, Chinese tech giant Huawei announced its new Kunpeng 920 ARM-based CPU designed to boost the development of computing in big data, distributed storage and ARM-native application scenarios. The Kunpeng 920 is the highest-performance ARM-based server CPU built using a 7nm process. The CPU was independently designed by Huawei based on the ARMv8 architecture and the chip significantly improves processor performance by optimising branch prediction algorithms which increases the number of OP units and improves the memory subsystem architecture. At typical frequency, the Kunpeng 920 CPU scores over 930 in SPECint Benchmarks test and is 25 per cent higher than the industry benchmark. Power efficiency has also been improved by 30 per cent and Huawei's new server CPU provides higher computing performance for data centres while reducing power consumption. The Kunpeng 920 integrates 64 cores at a frequency of 2.6 GHz and provides 640 Gbps of total bandwidth. In addition to the announcement of the Kunpeng 920, Huawei also released three new models of its TaiShan series servers powered by the new CPU. The first model focuses on storage while another aims for high density and a third focusses on balancing both. Huawei's TaiShan servers are built for big data, distributed storage and ARM-native application scenarios. In big data scenarios, the TaiShan servers are tuned for optimal many-core high concurrency and resource scheduling to deliver a 20 per cent increase to computing performance. “Huawei has long partnered with Intel to make great achievements. Together we have contributed to the development of the ICT industry. Huawei and Intel will continue our long-term strategic partnerships and continue to innovate together. At the same time, the ARM industry is seeing a new development opportunity. The Kunpeng 920 CPU and TaiShan servers newly released by Huawei are primarily used in big data, distributed storage, and ARM-native applications. We will work with global partners in the spirit of openness, collaboration, and shared success to drive the development of the ARM ecosystem and expand the computing space, and embrace a diversified computing era."